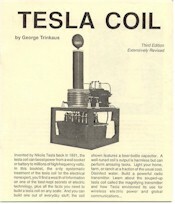 This classic, 21 page, Tesla coil construction manual uses the "cook book" approach to coil construction. Choosing to keep the mathematics to a minimum, Trinkaus instead to focuses on various options for the mechanical construction of individual oscillator components. Also mentioned are some of the hazards that can be associated with devices of this type. Included is a circuit diagram for a vacuum tube Tesla coil, plus information on some of the applications for which these transformers were originally designed.